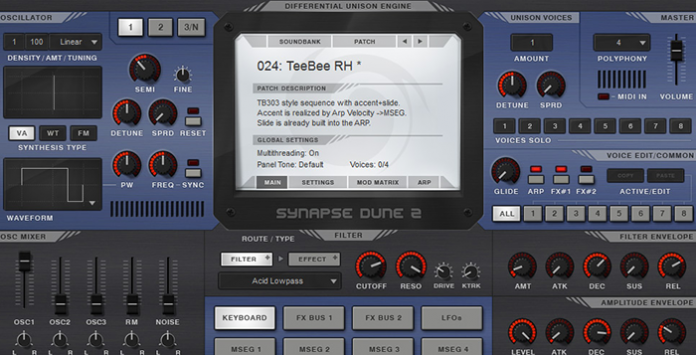 Synapse Audio has announced the release of DUNE 2, a new version of the synthesizer plug-in for Windows and Mac. DUNE 2 was rewritten from scratch, in order to provide a yet higher sound quality and allow for an even wider range of sounds. New oscillators, new filters, new effects and graphical envelopes are just some of the new additions. With a maximum reserve of 8320 oscillators at full polyphony, DUNE 2 is a true unison monster, unlikely to ever run out of oscillators. VA, Wavetable and FM Synthesis. Two oscillator stacks with 32 oscillators each. Third oscillator and noise generator. 8x Unison = up to 520 oscillators per note!. 16 voices of polyphony = up to 8320 oscillators total. Modulation matrix for synth and FX parameters. Two Master FX busses with 9 high-quality effects each. Innovative Arpeggiator with MIDI file import. Check out the audio demos below.